WHAT do Eason Chan, Alan Tam, Andy Lau and John Legend have in common with Ailee, IU, EXO, Sistar, Big Bang, 2PM and Song Seung Heon? The answer is the 2014 Mnet Asian Music Awards (aka Mama), billed as the Asian version of the MTV Music Video Awards to celebrate the South Korean music industry. South Korea’s top pop idols and celebrities — along with guests from Hong Kong and the United States — congregated in Hong Kong on Wednesday evening to perform, present and receive awards. 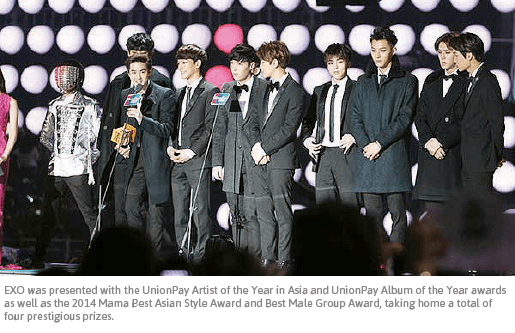 But it is much more than just another entertainment event, at least for the Hallyu movement — the Korean Wave. The awards event itself works more like a popularity contest, with most outcomes derived from online votes by fans. The key point here, though, is how entertainment company CJ E&M Music (which runs Mnet) has exported the K-pop trend and culture beyond South Korean shores. For the fifth year running, Mama has been held overseas, this year’s show making it the third time it was held in Hong Kong. Ticket prices ranged from HK$880 (RM390) to HK$2,080, and sales were swift if not instantaneous. It was reported that this year’s Mama received more than 10 million fan votes from 210 countries in Asia, North America, South America, Africa, Australia and Europe. Many of these fans also fly in to support their favourite acts. Despite long-time whispers that the Hallyu phenomenon is waning, the show nevertheless goes on strong, judging from the screaming fans at the AsiaWorld-Expo on Wednesday night. Fully backed by the South Korean government as a legitimate strategy, it was reported on Business Korea that a total of 327.9 billion won (RM1.01 billion) was budgeted in 2013 for various private and public sectors to promote “K-Culture” projects. While Hallyu now includes also arts, fashion, traditional culture and even sports, there is no doubt that entertainment is still at the forefront. According to the Hyundai Research Institute, the direct impact of the Korean Wave reaching a particular country translates into an increase in imports of South Korean goods. Their analysis showed that if cultural products exported increased by 1%, the correlating increase in consumer goods exports is 0.083%. For K-pop, it is a unique product that goes beyond music, selling a lifestyle and ideal that is deeply entrenched in consumerism. Award shows like Mama propagates its appeal. Take for example the most anticipated act that night, G-Dragon and Taeyang of the hugely popular group Big Bang, who closed the show with their latest hits Eyes, Nose, Lips and Good Boy. Their record company, YG Entertainment, recently announced a strategic partnership with luxury products giant LVMH, which also invested an approximate US$80 million (RM275.8 million) in the public-listed entertainment company. YG’s stable of singers and actors, including the likes of Psy, Big Bang and 2NE1, are often noted as much for their fashion as their talents. US R&B singer John Legend, who was presented with the International Favourite Artist award, guest performed his mega-hit All of Me and sung Green Light together with EXO’s Chen and SNSD’s Tiffany. Best female vocalist winner Ailee also performed Ariana Grande’s Problem along with pop group Girls Day as a special item. At last year’s awards, legendary musician Stevie Wonder performed a duet with Sistar member Hyolyn and Hong Kong Cantopop star Aaron Kwok. It also featured performances by Icona Pop, Ylvis and Paris Hilton. Hollywood and Asian superstars alike continue to take notice of K-pop’s broad reach. Meanwhile, every major South Korean pop star’s ultimate dream is to make it in Hollywood. Many have tried, all have failed. It would not be the most prominent showcase of Hallyu without the presence of variety, drama and film stars roped in. The Kwon Sang Woo-Choi Ji Woo pair were a much awaited presence, for instance. The two had just re-united for K-drama Temptation in July, the first time in 11 years since their first joint hit drama series Stairway to Heaven in 2003. Another pair that stole the spotlight were Chae Rim-Gao Ziqi. South Korean actress Chae, of All About Eve and Oh! My Lady fame, wed Chinese actor Gao in October. This was their first official public appearance after tying the knot in the groom’s hometown of Taiyuan in Shanxi province. The pair met when working together on a Chinese TV series and Gao proposed to her in June. Fans who loved popular variety TV show Running Man, in which cast regulars and celebrity guests compete to complete various tasks in a race, were swooning over cast members Song Ji Hyo and Lee Kwang Soo. The duo were only recently in Kuala Lumpur along with other members for a fan meeting in Stadium Negara. Pop music cable TV Mnet, owned by South Korean entertainment company CJ E&M, inaugurated Mama in 2009 and later expanded it into an international affair as the influence of K-pop and K-drama grew.